Dan Corbin's figurative sculptures are a convergence of conceptual tendencies and the human figure. In Corbin's intersection of figuration and conceptualism, past present and the future co-exist at the same moment, illuminating what it feels like to be alive during current times, with all its beauty, complexities, contradictions and possibilities. Multiple purposes are a recurring motif in Corbin's work. The artists sculptures address issues of contemporary society; materialism, industrialization and cultural change,while simultaneously referring to a wide range of human emotions. His sculptures lift the spirit while questioning what it is to be human. 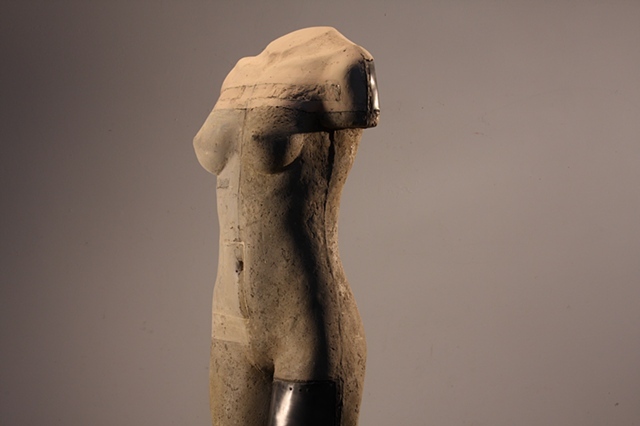 Corbin's sculptures postmodernist in nature are a tripartite of concept, emotion and content. He has rethought and remade figurative sculpture to reflect new global trends and social issues. His sculptures infer figurative representation has not lost its significance, moreover, it continues to meaningfully evolve. The perspective of history is a major influence on Corbin. Walking through our collective memories he barrows techniques styles and mysteries suited to his new representation of time and space. In Corbins new archetype of man intellect and soul are separated from the body. Armless headless anonymous cores can now be broken down to the smallest units, analyzed, engineered beautified marketed and sold. He rebuilds his new articulation of figurative sculpture with iconography of the present embedded in the surface of his sculptures. He calls these miniature time capsules inclusions. Cosmetic bottles, action figures, dolls, feeder fish, are sealed in resin and strategically embedded about the body. These inclusions invite conceptual questions. Will the perfume in the bottles dissipate over time? Is this a symbolic attempt at bioengineering a scented body? Do the embedded feeder fish represent a metaphorical attempt at cross specie engineering? In Corbins revised view of contemporary figurative sculpture individuality and physical essence have changed. The figure becomes a technologically enhanced vessel. The human body is no longer a container for a perfect being, handed down by god but an esthetically enhanced harbinger of a new era. Revisiting classical cannons of proportion form line composition and color, Corbin seeks to create a palatable kind of deconstructionism based on aesthetics. In combination with the inclusions Corbin uses a multitude of industrial materials, emphasis the intrinsic value and physical properties of each. The surfaces become fully charged with content primed for multiple interpretations. Multiple purposes are a recurring motif in Corbins work. His sculptures allude to an overriding materialistic theology while addressing a wide range of human emotions and feelings. His work lifts the human spirit while questioning what it is to be human.